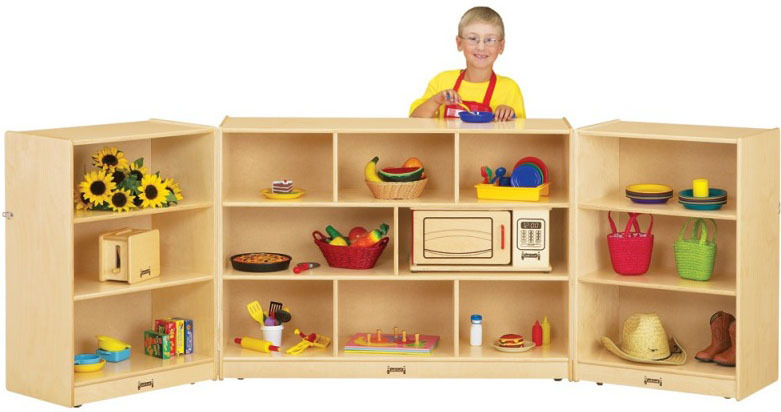 Maximum mobile storage space features sturdy, multi-purpose shelving. Opens to eight feet, using KydzHinges®, full-length piano hinges that are the strongest and safest for classroom use. Locking hasp keeps storage secure. Caster mounted for mobility. Recessed hardboard back. KydzSafe® rounded edges and corners. KydzStrong® construction. Extra durable, non-toxic and lead-free KydzTuff® finish that will not yellow. This unit ships fully assembled and includes a lifetime factory warranty. TRIPLE FOLD-N-LOCK STORAGE: 48" Wide x 15" Deep x 35½" High, each wing is 24" Wide, Unit opens to 8' Wide. Shpg. Wt.= 198 lbs.